In the sixty odd years since the first Bigsby vibrato unit was made, it's appeared on almost every type guitar imaginable. Paul Bigsby had a motto: 'I can build anything.' That attitude served him particularly well when one of the customers for whom he built guitars challenged him to 'build a vibrato contraption that works.' 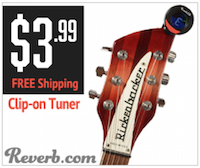 That customer was country singer Merle Travis who had been struggling with a Kauffman Vibrola vibrato bolted on to his Gibson G-10. Bigsby set about his task and in 1951 presented his friend with the Bigsby True Vibrato. The unit, like today's Bigsby's was cast from aluminium alloy and had six pins, which anchor the strings, along a rolling cam. The cam is manipulated with a flat, spring-loaded arm which stretches and releases the strings in order to raise or lower the pitch by half a tone. While that half tone change in pitch won't please fans of Floyd Rose whammys, or anyone who wants to dive hard into a vibrato arm, it's perfect for rockabilly and country and plenty of rock and pop guitar players have used Bigsby units over the years. John Lennon even fitted one to his Rickenbacker. 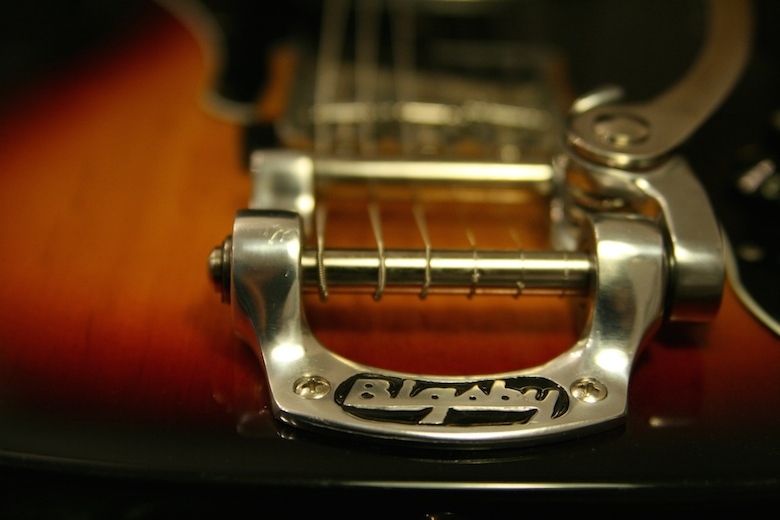 The Bigsby has a couple of advantages over other vibrato units. For one, it's surface mounted so is easy to retro fit. No routing needed, just a few screws. Secondly, it's a hefty beast so adds mass to the guitar. That in turn adds sustain and can enhance the tone. Oh, and of course, it looks gorgeous too. Don't believe us? Go Google Brian Setzer and have a look at his Gretsch with Bigsby fitted. Another vibrato unit just wouldn't look right. Setzer's Bigsby unit is a B6, the same one favoured by Eddie Cochran on his Gretsch. But a quick look at the Bigsby website reveals that there are several other models, each with a different shape, size and weight, making them suitable for different guitars. Heavier units, like the B7 are ideal for solid bodied heavy guitars like the Les Paul Standard and Custom. Bigsby himself spent the last 20 or so years of his life custom-building guitars for clients. He built as much as he could by himself, even hand-winding the pickups. The company to which he gave his name was sold to former Gibson president Ted McCarty in 1966 and then to Gretsch in 1999. Paul Bigsby died in 1968. To see eBay listings of guitars with Bigsby vibrato units click here.